Today, I'm going to show you exactly how to produce a poultry farming project report. In fact, I'll not only take you through the steps, but I'll also give you a free pdf sample template to walk away with. A great assist to help you on the way in rolling out a successful poultry project. Firstly, some ground rules, parameters & general housekeeping. 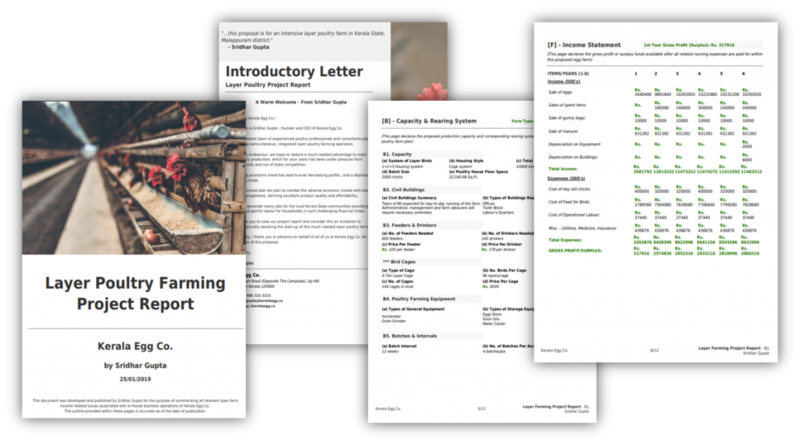 Within the following steps, we will show you how to build a report for your own poultry farming project - taking you through all the considerations. 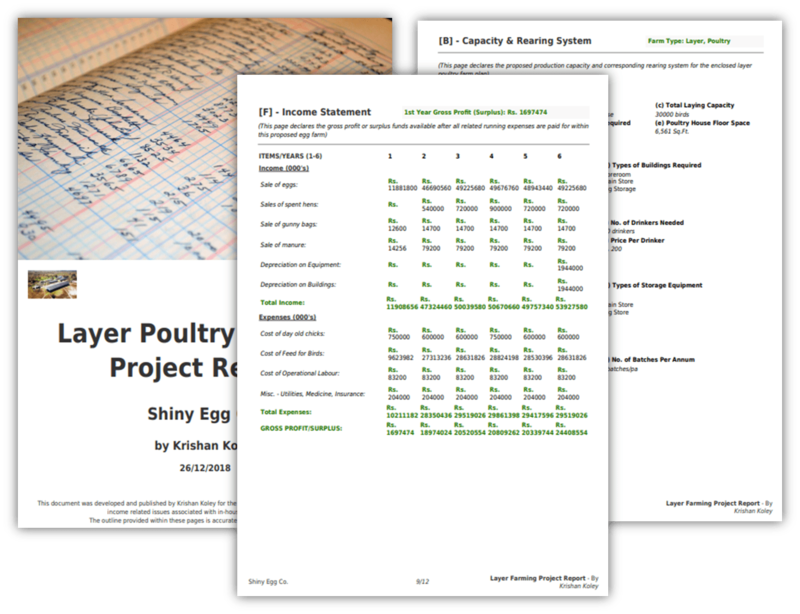 Before you begin writing your poultry project report, you'll need to produce some baseline stats to work from. This will require some diligent market research on your behalf. Such assumptions will be what the credibility of your project report will be based upon, so do your due diligence. Aptly entitle your poultry farming project. [If you have already decided on a trading name, then look no further. Put publish it on your from page. You'll want to be upfront about your preparedness. Remember to date your plan. This removed any shadow of doubt in the mind of the reader regarding how current the enclosed details are. Short, but sweet. Ample opportunity for a formal first impression. Effectively, this is an anchor page or a hub for the enclosed content. For the skim readers out there, this is a useful time-saving measure. 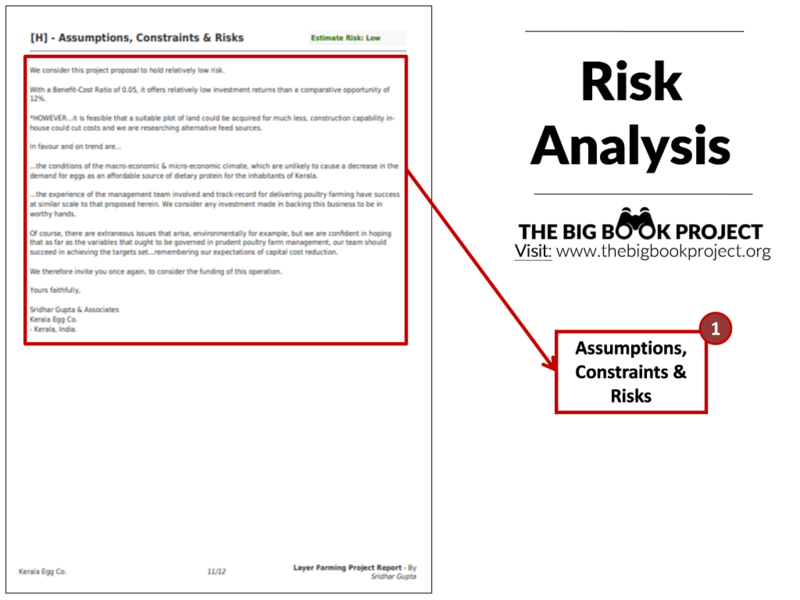 Allowing them to dive straight into the most intriguing detail of your project report adds value & saves precious time. Outline the chapters and the major milestones contained within your project. Our layer poultry farming projects reports, whether layer or broiler based have the same format. Your report needs a solid introductory letter. This proposal is a formal sales pitch from you and your team to your prospective investors or business partners. This covering letter should suffice a succinct summary of the ambition you have for the proposed poultry farm project. Sum up in short, but impactful fashion, the offer on hand and the foundation of your commercial vision. Location is a fundamental factor with the planning of any poultry farming project. It determines so many as well as a significant proportion of the associated costs. Logistics for getting produce to market, for example, are influenced by location. Access to water or good natural ventilation etc. Also, the ease of access to the land or proximity to amenities impacts feasibility for supplies etc. The idea with this page is to bring the reader into the meat of the location based project detail - beginning with context. This page holds the first substantial technical appraisal relating to your poultry farm project. ...relates to a layer poultry farm - making eggs the primary product. The adopted system within this example is a 1+1+5 layer housing system. The housing system used for any poultry farming project defines the method by which your scope/capacity will be 'turned over' for production purposes. In this type of layer housing set up, the farmer intends to build 5 layer houses, 1 brooder house and 1 grower house. The denominator is the batch size. i.e. the numerical factor, which overall farm capacity is a multiplier of. In the example above, the batch size planned for this poultry farm project is 2,000 chicks. This means each time new chicks are bought from the hatchery, the farmer will buy 2,000 at a time. Total farm size at any given interval in the rearing cycle, by number of birds, at full capacity will be 14,000 birds - with only 10,000 of those at most being birds of mature enough age to consistently lay eggs. According to FAO recommendations for optimal poultry farming results, layer birds ought to be given 1,800cm2 minimum floor space within the poultry house. This converts to: 1.93 sq.ft. Floor space is critical to achieving optimal output levels in egg production. It impacts the bird's ability to reach target weight and size for producing the highest quality eggs, at the highest rate. Insufficient space increases stress. More stress reduces weight of bird and egg productivity. Recommendations also state that the poultry houses should be spaced apart by 30m distance. ...avoiding disease or pathogen cross-contamination. The overall floor space required for this particular poultry farming project is estimated as being just over 23,000 sq. ft.
Caged systems require less floor space compared with deep litter housing. And without need of redeveloping the housing should a change occur. What importance do civil buildings have within the planning of poultry farming project? shows a layer poultry farm of a known bird capacity. This obviously dictates the necessity of staff labour. These buildings are needed for equipping the farm's staff with adequate accommodation for a variety of functions. What is this section instructing us about the need of bird feeders and drinkers? Feeders and drinkers are required for all poultry houses, this system is without exception. As we said earlier, the total flock size which this farm hosts at capacity is 14,000 (10,000 layer birds, 2,000 grower birds and 2,000 brooders/chicks). Each poultry house will require a distribution of feeders and drinkers which are of accessible quantity, positioning and height for birds to benefit. How did we come up with the numbers quoted? Every manufacturer of feeders and drinkers quotes a specified number of birds, of a given age, that their equipment will accommodate. The unit costs per feeder or drinker are also quoted. This simply is a place where you would input any additional equipment necessary for upkeep of poultry farm operation. What is included in this section depends on the nuances of your own poultry farming project. What do we mean by batches and intervals? Why is this so important for the running of your poultry farming project? For the sustainability of your poultry farming project and consistent production for routine market delivery - you must continually top up your existing stock with new bird stock at expected time intervals. Each production system has it's own characteristic profile. Each system has it's own unique profile of production levels and therefore necessary input. Remembering, however, that batch size is the critical multiplier in calculating projected numbers. From the example in the screenshot above, you can see confirmation of the layer system used being 1+1+5 as declared in the intro B1. The batch interval declared is 12 weeks and the average batch number per annum bought is 4 batches. 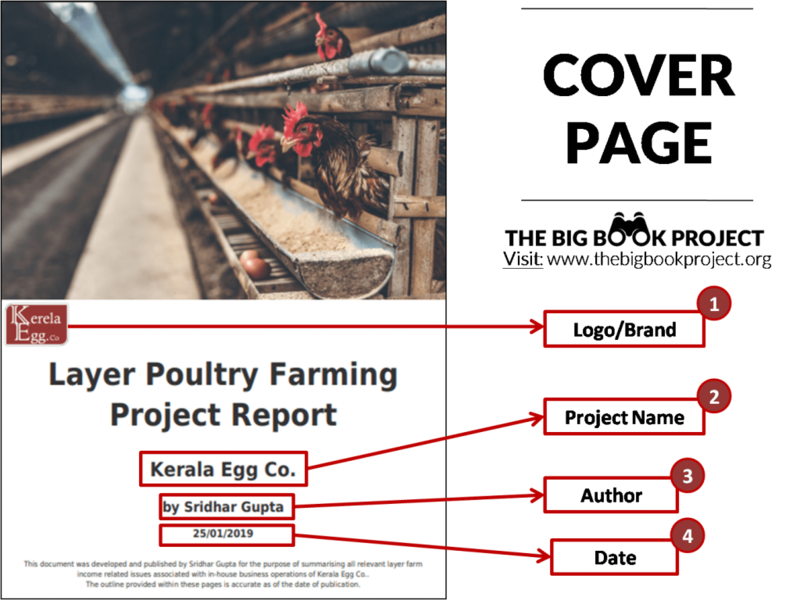 This section of the plan just provides some common landmarks from which to base projections further on in your own poultry farming project report. Why are new batches bought periodically? The egg production ability of egg laying hens is thought to be commercially optimal throughout the ages of 20 weeks to 72 weeks. After 72 weeks, layer hens are generally regarded as being unprofitable to commercial layer operations and are culled (removed). The operational overheads of a poultry farm project are the ongoing costs of staying in business. ...are all to be accurately accounted for, in order to produce realistic month-on-month & year-on-year financial projections. This statement neatly encompasses all of those points within a glance-friendly one-pager. What importance do day of chicks have to your poultry farming project? Firstly, each breed of layer bird has it's own typical output of egg production once mature. Choose your preferred breed of layer carefully. Bearing in mind, feasibility of egg production under your prescribed operational (climatic) conditions. BV 300 layer bird produces on average 287 eggs per year of peak egg production. With an expected bird mortality rate of 5% per bird purchased i.e. in every 100 chicks bought, it is expected that up to 5 birds might die whilst being reared on the farm. Bird mortality directly impacts on the bottom line profitability of your poultry farming project. The more birds that die, the fewer eggs your farm produces. Therefore bird mortality is preemptively addressed in the planning project by buying in excess of your planned batch size. The exact number of additional birds would equal the number expected to die during handling, according to your bird mortality figure. Therefore the actual batch size purchased would be 'batch size (2,000 birds)' + 'expected bird mortality (100)', if 5%. The average cost per chick is then the multiplier against the 'batch size + bird mortality' figure. The product of that multiplication is the cost of buying a batch of chicks from the hatchery. Want to find out how much buying batches of chicks would cost you per annum? Simply multiply the cost per batch by the number of batches your rearing system dictates you buy per year. How important a point is feed within your poultry farming project planning? As a topic, is it really worthy enough of having a cost break down all to itself? The cost of poultry feed (as proportional in related to the other associated operational costs of a poultry farm) has been commonly touted as being anywhere between 50%-70% of running costs. Highly significant. A majority cost factor for any commercial poultry farm. As a critical success factor of commercial poultry farming in this day, cost of bird feed is often a maker or breaker of either a layer or broiler business. Getting a firm handle on feed costing early on within your poultry farming project, will assist you greatly in maximising ROI (return on investment). The cost of feed is approximated at Rs.20 per kilogram of feed. Then there is a cost for the estimated feed demand of a batch of birds. Actually, 2,100 chicks, including expected bird mortality rate, this is the figure preferred for feed cost projections. Although 100 birds are expected to die, we don't want to 'under'subscribe feed should we achieve a better rate of flock survival. But...how did we arrive at the figure quoted above of 94,479 kg of feed consumed per batch of 2,100 birds? According to the FAO guidelines, the average amount of feed consumed by one single batch of 100 layer birds from day 1 to week 72 is 4,499 kilograms. If we have a batch size (+ mortality rate) of 2,100 birds - that would equate to 21x the feed amount above. And to get to the annual cost of feed bought of Rs. 7,558,320...we simply multiplied 94,479 kg of feed per batch by 4 batches on average bought per annum under 1+1+5 system...then, multiplied again by Rs. 20 per kg. How important is it to present your overheads related to you poultry farming project? As overheads are recurring costs, if you get them wrong once - you pay for it many times over in the future. Ongoing financial prudence impacts cash flow (available cash) and of course profitability (how much you hope your project will pay you back in earnings). The key to getting this part right is acquiring accurate service quotes here from your locality. 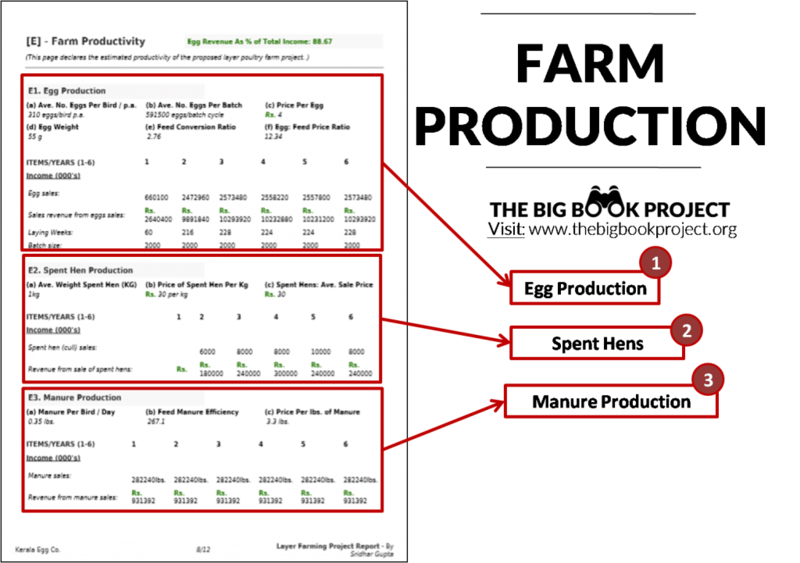 Accurate costings are a critical part of running a successful poultry farm project. Maintaining a healthy flock is critical to preserving your expected profits. The risk of sickness to your birds is a very real financial threat. More bird deaths = less productivity = less sales revenue = less profit. Whilst diligent, preventative care is the key deterrent for outbreaks of disease, it is generally accepted to preemptively attack potential issues with a course of medicines. Insuring your livestock against unforeseen loss with an insurance policy might be your idea of hedging against this potential financial risk. Buildings and contents insurance may offer peace of mind against any adverse circumstances such as theft, for example. This cost is estimated in the table above within this example. Lighting and use of other electrical appliances will place a demand upon your infrastructure for electricity. In this section you want to declare your expected electrical services expenditure. Your poultry farming project will require a consistent supply of clean water to keep your flock hydrated in all weather and conditions. If there are associated local authority costs or provider costs, then insert them here. Your birds will require constant hands-on care to produce the kind of results that your project report estimate. Reliable, experienced handlers and farm labourers will increase your chances of achieving your business goals. Account for staff costs here. Transporting your produce to market is the delivery end of your poultry farming enterprise. This is where all the hard work should pay off. Every penny counts within your the contribution to your profit margin. Don't fall short of producing an accurate and itemised cost for transporting eggs or meat to market. Keeping buildings, equipment and ground maintained provides optimal conditions for a more productive poultry farm. The cost of maintaining your farm is detailed here. Exactly that! Anything that doesn't fit in above goes right here. Step 8: How much does your poultry farming project cost to get out of the gate? Every poultry farming project has a round figure start-up cost. But on the way to arriving at such a figure, we need a detailed and itemised list. Capital start-up costs are divided into one-off and recurring. The capital cost statement above is a key component of your poultry farming project report. It informs the reader of what it will take to get your proposed project up and running or initiated. Thereafter, once begun, your project should produce a healthy enough supply of profit to sustain both it's operation and growth. how much personal money you are willing to invest into the project yourself? The capital costs enclosed in the box above are one-off costs. They are to purchase one-off pieces of equipment or to set-up access to services. The costs of the items will vary from market to market. Whilst we have a comprehensive array of cost categories above - you might want to augment this list to suit your own individual project parameters. Obtaining accurate pricing is key to starting successful poultry farming projects. This is the most sure way of getting your prices right & having a disciplined approach to procurement. Requests for quotes or proposals from reliable and reputed suppliers will set your estimates within the right bounds. These figures should look familiar. There comprise the overheads which we have already look at in depth in a previous chapter. Really for the sake of your prospective investor when quoting the amount of total capital needed. It is necessary to detail not only the one-off capital cost items, but also to see them alongside those working capital items i.e. initial monies required to set the wheels of business operation in motion. e.g. buying your first batch of chicks, buying your first round of bird feed etc. This is your official start-up figure for required capital. The cost of everything you will need to get started - from one-off purchases to initial operational costs. Included in this summary is the amount of personal capital funds which you are committed to investing in the proposed poultry project. This in some cases & markets is known as 'margin money'. 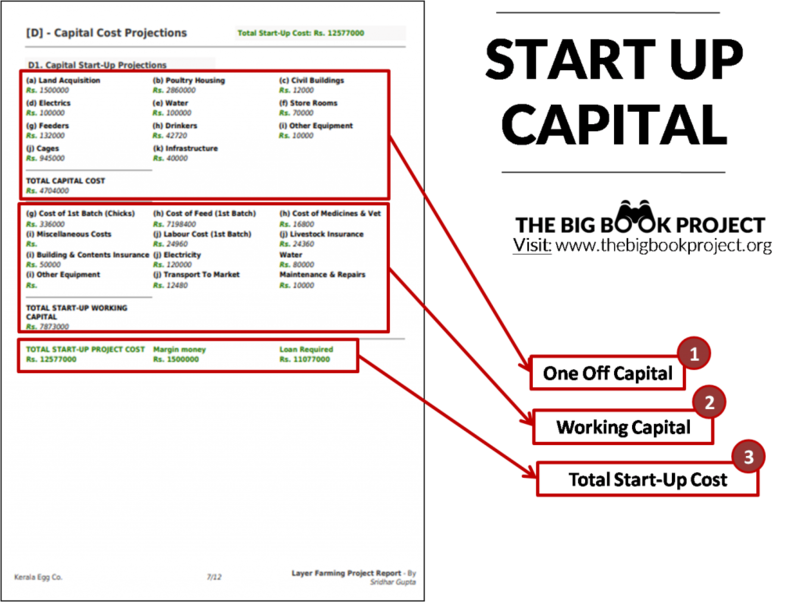 The total capital cost of your project minus your personal contribution (aka. 'margin money') leaves only the remaining sum to be invested, gained either by loan, grant or some alternative arrangement. How is farm production quoted within a poultry farming project plan? Primarily, the type of poultry farm will dictate the produce it generates. This will be distinct one from another - and therefore your project plan will need to signify this. The rate of egg production on a poultry farm is dependant upon many variables, which experienced farm hands will be most aware of. However, within the context of your project report, you will want to set some firm expectations, on the assumption of course, that your exercising of animal husbandry will yield optimal results. On what do your base your expected productivity figures? We need some universal benchmarks. We aligned the adopted operational set-up and practices of this proposed poultry farming project with International FAO guidelines. On this basis, we deem it also feasible to quote the FAO expected farm production levels in association with this project. Yet flexible enough to help you do some accurate scenario planning. Want a commercial egg production model for your poultry project? When we scan over the 6 years worth of projected production and sales, we find a major discrepancy in year 1. This figure is about one quarter the level of subsequent years. Remembering to achieve the most profitable & consistent results, we choose not to buy hens at point of lay i.e. mature... but rather at 1 day old. At the beginning of the project, you start with your first batch of chicks. Your farm therefore begins at zero-production. It takes approximately 20 weeks to get your batch to mature egg laying age. During this stage you have no egg production. Production is offset until your 1st batch gets to maturity. After that, you have approximately 52 weeks of egg production from that batch. Meanwhile, 12 weeks after the purchase of your 1st batch, you buy another one (according to the 1+1+5 rearing system). Again, this 2nd batch is bought at 1 day old and egg laying is therefore offset with this batch also for 20 weeks. Using this 1+1+5 system... each batch of birds, of egg producing age, during any given week within your farm production schedule contributes to the number of 'laying weeks' of the farm. 'Laying weeks per annum' is the number of active egg laying periods or scheduled slots which batches within your farm contribute to egg productivity. With 3 out of 5 batches offering optimal laying rates & 2 out of five offering less than optimal egg laying rates because they are either newly purchased and still immature. Or batches which are about to reach the end of their commercial laying cycle of 72 weeks and are about to be sold, as 'spent hens'. Because of this continual process of decommissioning and replenishment of layer batches in order to maintain optimal rates of egg output, the available 'laying weeks' of your poultry farm will be in flux year to year. Some years producing more 'laying weeks' thank others. Hence why you don't get identical production figures, nor sales figures...year on year. The same is also true of alternative egg laying rearing models like: 1+2, 1+3 (the most commonly quoted). The only consistent figure quoted is the batch size which in the case of this example is 2,000 birds. 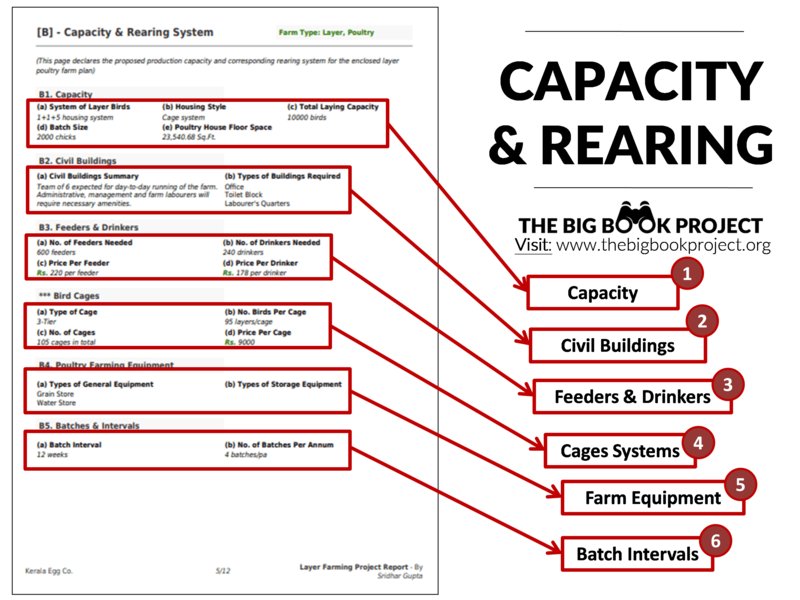 Whatever your chosen batch size, the number of birds in a batch should remain consistent in order to achieve consistent production levels as a farm. 'Feed conversion ratio (FCR)' and 'egg feed price ratio (EFPR)' are commercial economic analytical indicators, as opposed to vital operational statistics. The practical importance of these numbers is relatively unimportant to practical farm planning, but suffice as economic markers related to cost efficiency. More on these in another article. What happens to layer hens when they get to the end of their commercial viability & profitability? I.e. What is a hen worth when the value of the eggs it lays is less than the costs to keep the hen? You simply sell the unprofitable hen at the market, as discounted chicken meat. Layers aged 72 weeks are typically sold in this fashion. Whilst they don't carry the same mass and quality of meat as an official broiler bird - they are still worth something at market. Their meat is often made available as alternative cheap meat for those who need, or they are further processed to make a variety of derived food products, like stock flavourings etc. If it takes 72 weeks for a laying hen to reach the end of it's commercial laying lifecycle, then it is impossible to raise any birds bought at 1 day old to this end within a 12 months (52 week cycle). How many times does 72 go into 52 = zero. Year 2, the earliest bought batches from year one reach the end of the commercial life cycle (72 weeks), whilst other batches bought at 12 weeks intervals apart are still producing well enough to keep. Subsequent years of production yield with 4 or 5 batches of spent hens which are available to sell - as the waterfall pattern of 'sequential flock rearing' flows in that customary staggered fashion...producing more or less from year to year thereafter. News Flash: Your bird waste has great value to your neighbouring crop farms! Sell on your manure waste as a natural source of fertiliser. In doing so you increase your poultry farming project profits & consistently so. This additional stream of cashflow adds financial efficiency & robustness to make your business model run all the more smoothly. Papering over any emerging cracks should 'cost of goods sold (COGS)' increase or winds of economic change go against. But how do you account for this figure within your project plan? According to The University of Hawaii, the average mature laying hen produces about 130 lbs of waste per year. Divided by 365, this equals approx. 0.35 lbs of manure produced per bird, per day. For the purpose of this scenario we work from a number which is 50% of this benchmark. The figure of 0.35lbs of manure per day per bird was assuming we are assessing a fully grown hen. We intend to buy chicks from one day old within this poultry farming project. Therefore, there are several weeks where the manure production in mass compared with a fully matured hen will be reduced. Also, there is the potential loss of manure during collection and processing, reducing the figure available for resale further. This therefore brings our manure production figure to approx. 0.17 lbs per bird per day. You get 496,400 lbs of manure produced, each year. Want to know the profit position of your poultry farming project? This income statement is a summary of your combined income streams lined-up against your collective running costs. The fruit of an income statement is the figure of gross profit or surplus at the end of each year. Or otherwise, losses incurred (negative value). Above we have the income half of the example income statement. As you can see, each line of income is itemised by title of category. 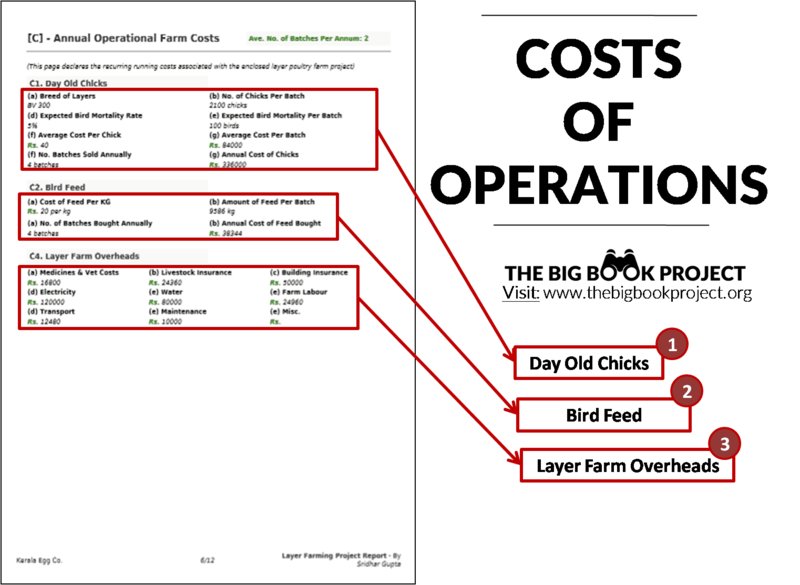 The final row (whose header is in bold green text) is the total figure of all income streams added together. As well as their corresponding numbers. Gunny bags are used hessian sacks which your bird feed typically arrives in. These gunny bags hold a stable resale value for re-use. This is an additional income stream worth noting. The table above is a rundown of the common expenses of this poultry farming project, as declared in the previous chapters. The only addition here is depreciation. "The monetary value of an asset decreases over time due to use, wear and tear or obsolescence. This decrease is measured as depreciation." 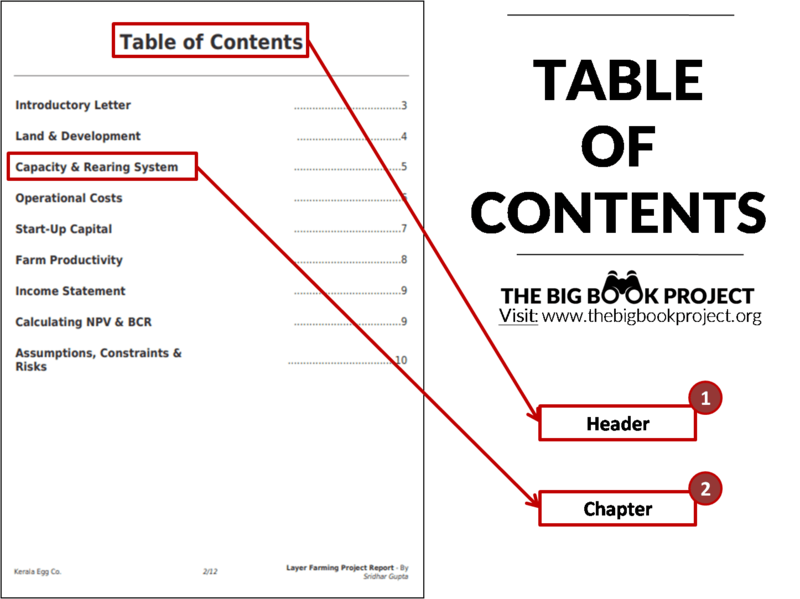 Why is depreciation added to expenses on your income statement? Financial prudence would have it that in planning your proposed poultry project you account for the replacement of capital items for wear & tear in particular. "The depreciation reported on the income statement is the amount of depreciation expense that is appropriate for the period of time indicated in the heading of the income statement." Why nothing more accurate than nominal/arbitrary figures? There are just so many ways to calculate depreciation and account for it in formal paperwork that we decided against prescribing. Each industry, country and tax jurisdiction will dictate norms which we just couldn't account for within the scope of this article. The table above shows the gross profit of your poultry farming project, across the 6 year period provided. From this figure...repayment of debt obligations, taxation, reinvestment and personal dividends/earnings shall be subtracted. What is the proposed benefit of your project to a prospective investor, minus the discount of a competing opportunity's interest rate & future cash flows? What is the ratio of the profitability of your project vs. the capital start-up cost? 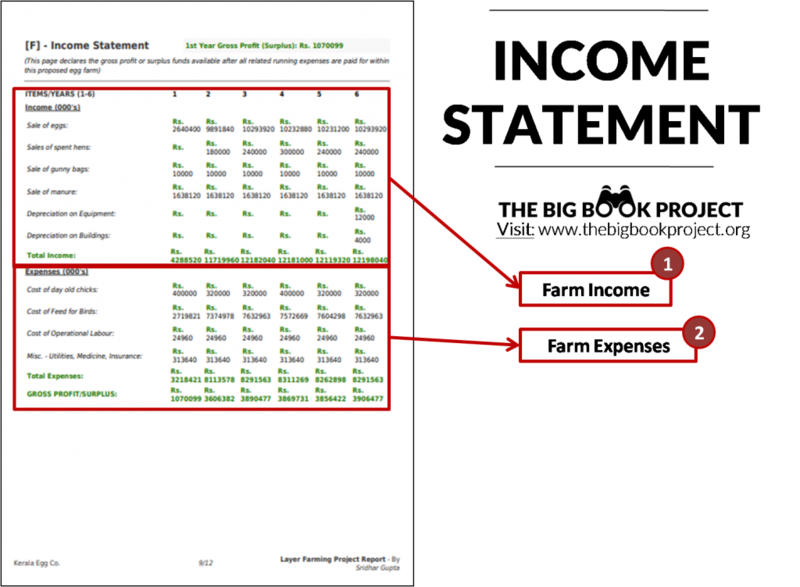 Meet net present value and benefit cost ratio. Why are the values discounted? Investors use NPV and BCR as indicative markers to inform them of whether of not the proposed project is technically beneficial or attractive. A yardstick or general measure or rule of thumb. Rt = the net cash flow i.e. cash inflow – cash outflow, at time t.
A comparative interest rate of 12% is used for the purpose of this analysis. The cash flows in the table above are therefore discounted across the 6 year period by the interest rate of 12%. When we discount the cash flows in this way we are saying, this is the cash remaining after taking away the projected benefit of a comparative gain of an alternative investment benefit. Discounted cash flow is the benefit remaining from running the proposed poultry farm across 6 years above and beyond the gains projected from let's say, a 12% savings account. But what does this mean exactly? And how will an investor interpret this? The ratio result is how many (whole) times the net discounted returns (potential earnings) of your poultry farming project can absorb the total capital cost. So what does a BCR of 0.05, really tell us? "...if a project has a BCR that is greater than 1, the project will deliver a positive NPV and will have an internal rate of return (IRR) above the discount rate used in the DCF calculations. This suggests that the NPV of the project’s cash flows outweighs the NPV of the costs, and the project should be considered. 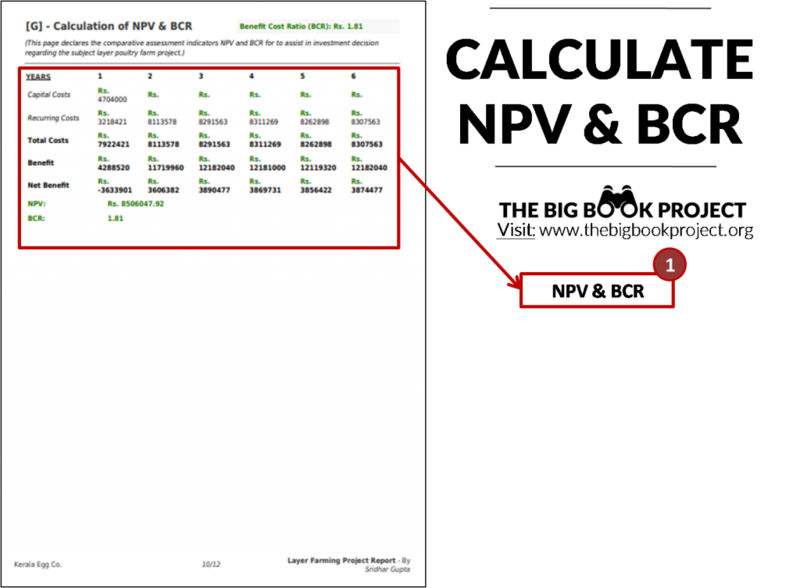 If the BCR is equal to 1, the ratio indicates that the NPV of expected profits equal the costs. If a project's BCR is less than 1, the project's costs outweigh the benefits and it should not be considered." Is Sridhar Gupta and his management team likely to raise commercial investment funding with this layer farming project report?...given the BCR is below 1 at 0.05? Because the costs of the project outweigh the potential benefits. Investors will look for more advantageous opportunities to invest in. As any investor will tell you, the value of money is either increasing with interest or decreasing as weighed down by inflation and opportunity cost. To sink financial investment into a poultry farming project with no real prospect of an increase or return on top of your investment after the duration of use or borrowing - would effectively be a waste of your time and resources that could have be better used elsewhere. So what advice do we have for our 'would-be' poultry farming entrepreneurs? Just return to the drawing board and re-calibrate. The problem lies in capital start-up costs. They are relatively very heavy. What are the most heavy capital cost items in this example? ...look no further than land and cost of building hen houses. How can we significantly reduce the capital start-up cost in an attempt to improve BCR? ...what nugget of consideration do you want to leave them with? This final section and conclusion of your poultry farming project report has great tactical purpose in the process of selling your project proposal to prospective investors. What's the purpose of this chapter of your report? Every successful sales process deals competently, confidently and comprehensively with the prospect's objections. In other words, the ideal investment pitch answers well the questions which investors have that cast doubt in their minds on their willingness to commit. Your poultry project report if it is to secure funding on your behalf, should openly address assumptions made, constraints involved and risks pertaining to your vision. Investors are going to ask you such questions. Why wait to be challenged? Why not rather preemptively tackle these and turn them into an opportunity to add assurance? This clears the air and leaves all things said in good order. The goal is that you get the approval. We recommend that you thoroughly read & re-read this article - go back over the detail and revise the techniques used. Our methodology is highly researched and adheres to various international industrial and technical standards. Having said this, the layer farming example used throughout the thread, of course, has it's limitations. Firstly it is a layer farm, not a broiler farm. Secondly, it is set within India. But there is no reason why the methods used couldn't be transferred to: Kenya, Uganda, Pakistan, South Africa etc. This being said, keep visiting regularly because we have in the pipeline a whole host of useful learning resources to help you get your poultry farming project off the ground. 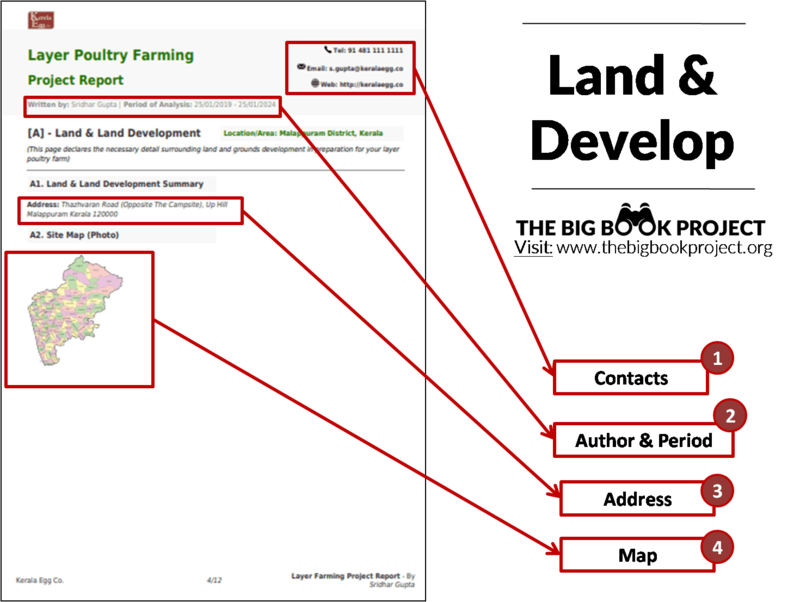 If you would like to take a look at a PDF print out of this example layer farming project report - get your downloadable 10,000 bird layer farming project report. ...feel free to contact our consultants. 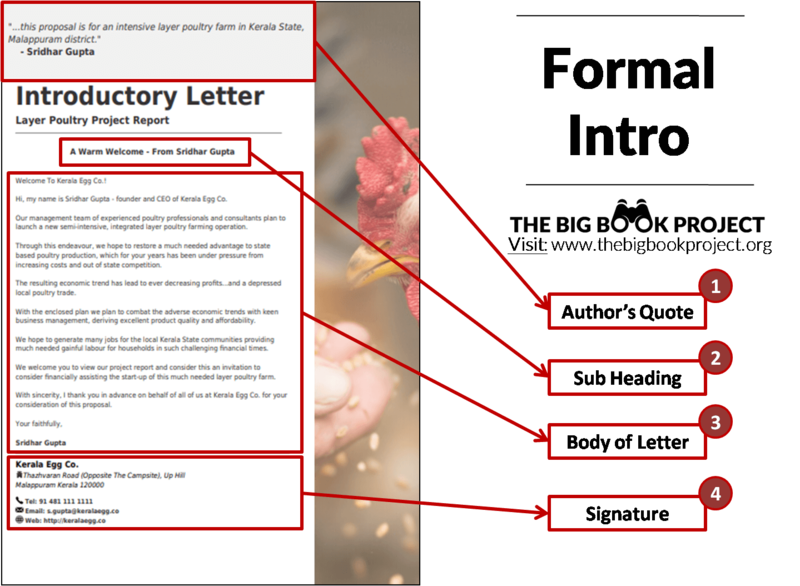 Have any advice or knowledge to share on the topic of poultry project reports? Thank you for reading this guide and we hope you've found it useful in assisting you in writing your own report.